Carrollton, signed to Centricity Music in 2014, have had an eventful, surreal yet inspiring ride to their success thus far. Releasing their full length debut album Everything Or Nothing in October last year, on the heels of their EP’s Breathe In Deep and Sunlights and Shadows in 2014 and 2015 respectively, as well as having the opportunity to cover Alessia Cara’s “Scars To Your Beautiful”; another golden opportunity to show the world their music came knocking in the form of their latest single, titled “Made For This”. In fact, this in-your-face 3-minute guitar led rock anthem resonated so much with Centricity Music, and Centricity Publishing, that they shared it with NBCUniversal executives a while back, and the rest is history. Turned out that “Made For This” was chosen to be THE song to promote the 2018 Winter Olympics, shown on TV on NBC. The song was heard on NBC advertisements and other NBC features promoting the worldwide competitive sporting spectacle. And on such a world stage, these guys should be proud of this quality song, as more and more people around the world are exposed to the music of this brilliant band. Now fast forward to now, and Carrolton have finished up their brand new EP, with Made For This releasing to digital outlets yesterday. The title track draws my attention first up, with the guitars packing a big punch, and so does the message, as we remember that as humans going through life, success can be linked to determination; and what we can and want to achieve all comes down to whether we believe we can conquer and adversity thrown at us, and whether we deserve to be the best and greatest. As a Christian band, Carrollton know that with God all things are possible; but with no mention of God or Jesus in the song, we are met with a ‘positive mainstream song’ if you will, which points out that if we believe that we are made for doing ___ with our lives, then the determination and belief most likely will get us there. Which isn’t a bad message by any means, actually quite the opposite. It’s just that this may be the start of Carrollton breaking into the mainstream market, and sharing the love of Jesus in a way that is more covert. 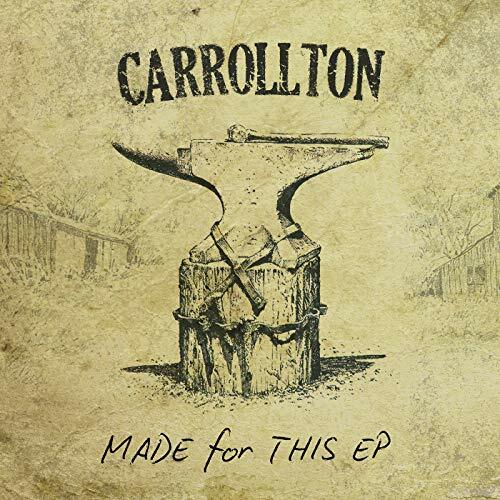 Like Switchfoot and needtobreathe, Carrollton have a perfect platform now, and from the remainder of the three tracks, it’s clear that at least for this release, the band is meant to reach a far wider audience than just believers. While EP opener “This Is My Time” is thematically and musically similar to “Made For This”, the 3 minute rocker is super catchy and we are presented with an inspirational melody that reiterates that right now is our time to do the things we want to do. The EP ends as quickly as it began (one of the only nit-picks) with the 2 minute southern rocker “Untouchable” and the rock ballad “Hey Kids”, with the former declaring that we are untouchable because of our will and determination to overcome any adversity, and the latter a hand clapping guitar strumming rock tune highlighting the notion that the fans are the ones who keep the band going, thus Carrollton are doing a ‘shoutout’ here, acknowledging that it is the listeners than have the most impact on the lives of the band and maybe vice versa. Carrollton’s Centricity Records’ full-length debut is something to savour, and is a great alternative if you’re looking for something with a bit more edge in your worship. And their follow-up Made For This carries on the trend of inspiring music. With a bright future ahead of them, listening to Carrollton’s music is a must for fans of southern gospel, country, rock, and worship, or all four! There’s nothing much more to say for me to try to convince you to check out their music…so, let’s take the plunge! Are you with me? Made For This is the start of something special for the band, either way, and an EP that I think you all should check out, especially if you are feeling uncertain about your future directions in life. Previous PostCrowder – Red Letters / Wildfire (Single)Next PostTOP 10___: 30 most impacting Switchfoot songs ever!